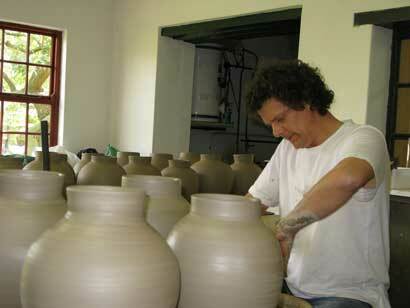 This project: Tea Canisters for Nigiro Tea Merchants, was undertaken in collaboration with Paul de Jongh and his wife Nina Shand from Millstone Pottery in McGregor, and involved the making of tea canisters each weighing about 4.5kg for Nigiro Tea House and Specialist Tea Merchants in Cape Town. Nigiro is a subsidiary of the very well-known Origin Coffee Roasters, also in Cape Town. 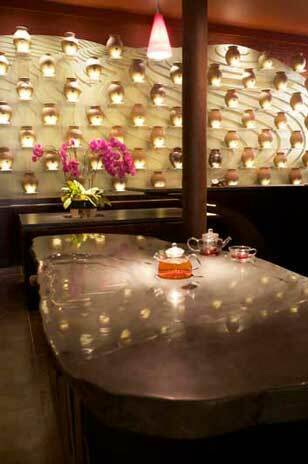 The canisters that we made are displayed on individually lit Perspex plinths mounted on the landscaped back wall of Nigiro and contain a wide variety of teas. 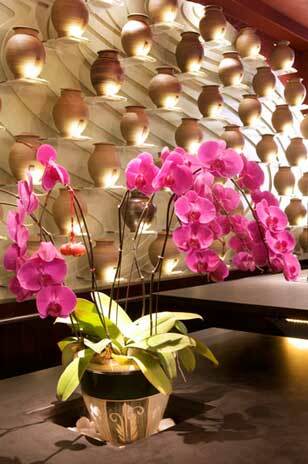 This absolutely innovative interior was designed for Nigiro by George Reeves, also from Cape Town. 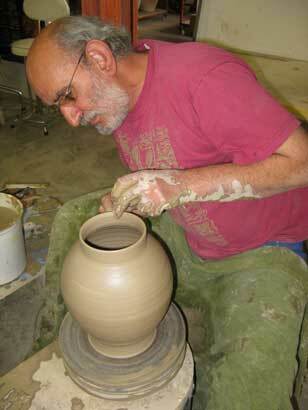 David throwing a tea canister. Paul throwing a tea canister. Tea Canisters drying outside. Felicity & Paul attaching the Nigiro logo. Tea Canisters drying outside. Drying. 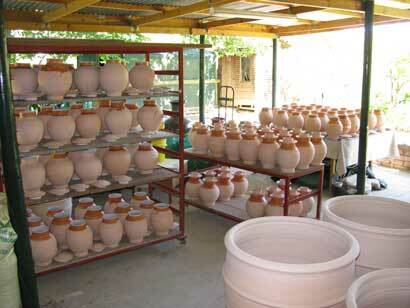 Bisque firing packed. 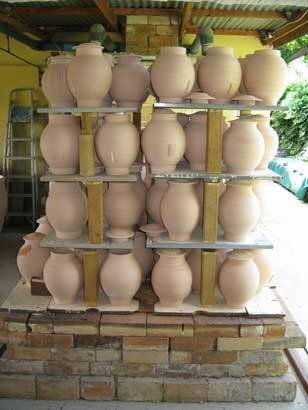 Bisque firing completed. 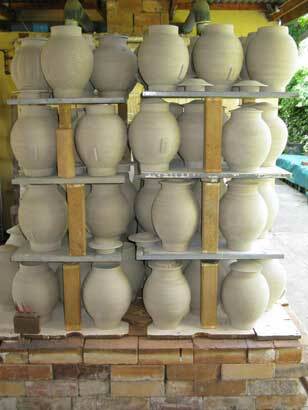 Nigiro tea canisters glaze, waxed & ready for their glaze firing. 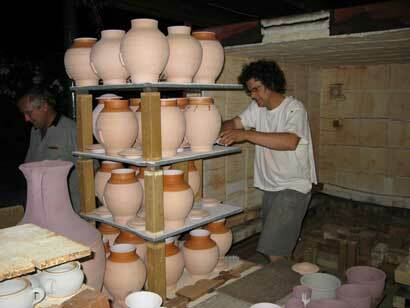 Paul & Myburgh packing the glaze kiln. Glaze firing completed, pots cooling. Felicity & Paul’s wife Nina packing for transport to Cape Town. Nigiro Wall. 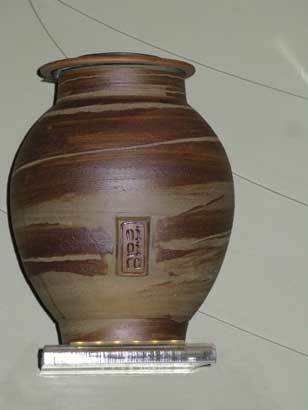 Close up of a Nigiro Tea Canister showing the logo. 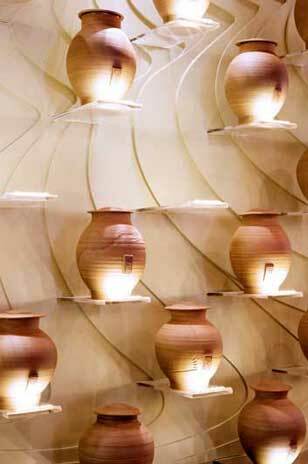 Nigiro Wall close-up. 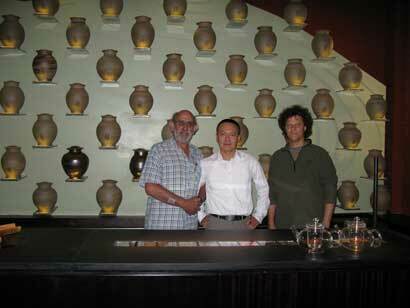 David, Mingwei of Nigiro, Paul at the launch of Nigiro in Cape Town. Close-up showing logo and brushwork using a dark clay slip. 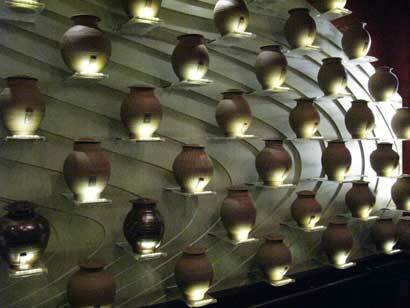 Nigiro wall. 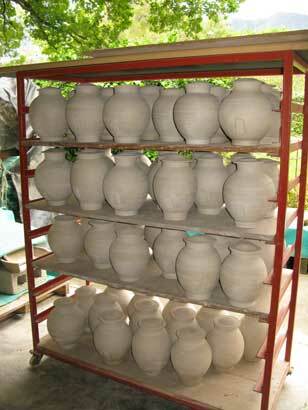 The canisters were made using our coarse stoneware clay body, the same clay mix that we use on our very big pots, unglazed on the outside and glazed inside with our light khaki / green glaze. 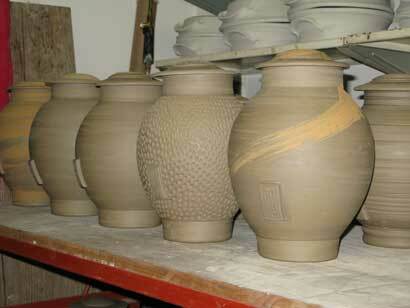 Some of the canisters were textured on the outside or coated with a rough earthenware slip. Each tea canister has a Nigiro logo made as a rectangular clay medallion attached to the outside. 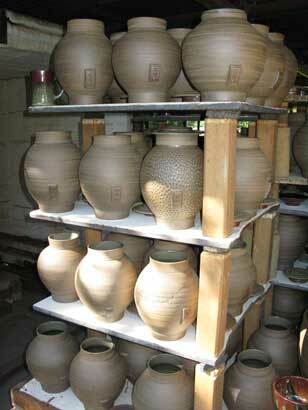 They were glaze fired in our big kiln, in a reduction atmosphere to a temperature of 1 320, Orton Cone 12. 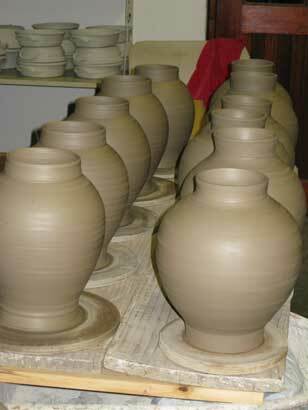 Thank you for spending time on our Tea Canisters for Nigiro Tea Merchants pages.